Without breaking the tradition of visiting National Parks during the July 4th weekend, we headed to the Mesa Verde National Park this time. We visited Rocky Mountain National Park, Yellowstone National Park and Yosemite National Park during the last 3 summers in the US. 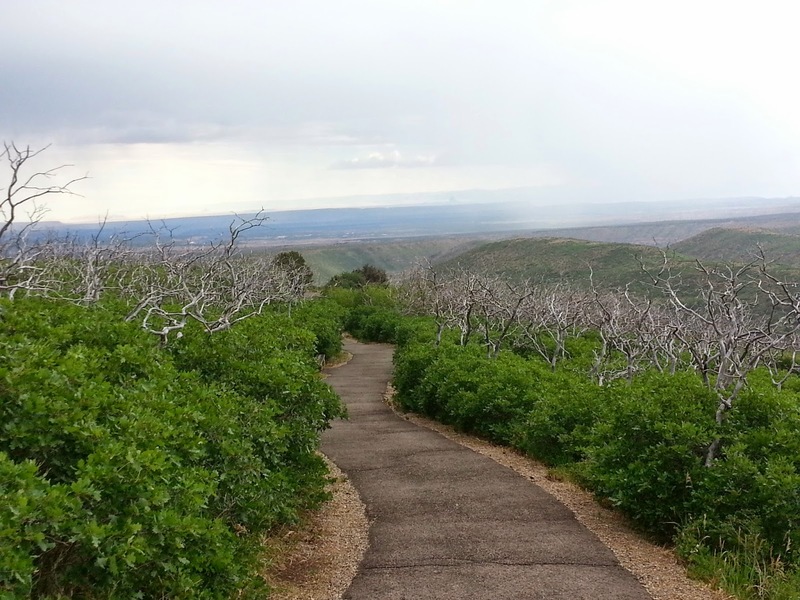 While all those parks are known for their beauty, Mesa Verde is known for its history. Needless to say, it was a different experience, which I surprisingly enjoyed, and want to share with all of you. Before I get into the historical prominence of the Park, I would like to write about the Morefield campground, where we camped in a tent for 3 nights. It is a huge campground with tent only sites, RV sites and full hookup sites. With the exception of full hookup sites, you just need to reserve a camp site and pick any site of your choice. This meant looking for an empty spot in the middle of the night when it is pitch dark and you can see nothing except as far as your car headlights go. But this also meant, you can move to a better site in broad daylight the next morning, which we did by just shifting our tent (advantage of having a small tent meant we could just carry it across the road as it is :). We found a site we loved and settled there for the next 2 days. The campground also has excellent amenities such as free hot shower facilities, abundant restrooms throughout the campground, coin operated laundry facilities, cafe providing breakfast during the summer, a store selling everything a camper would need from salt to firewood and an amphitheater with great programs during the night. Once we found a site of our liking, camping here was a pleasure. And several friendly deer roamed freely in the campground. It was a pleasure watching them as we ate our breakfast. Now coming to the main attractions of Mesa Verde National Park, which are the ancient cliff dwellings built by Ancestral Puebloans, sometimes called the Anasazi, in the 1200s. They are typically built in alcoves as a protection against weather. The cliff dwellings also had storage rooms for storing food grains, religious prayer rooms called kivas and it is believed that people lived together in communities in these dwellings. 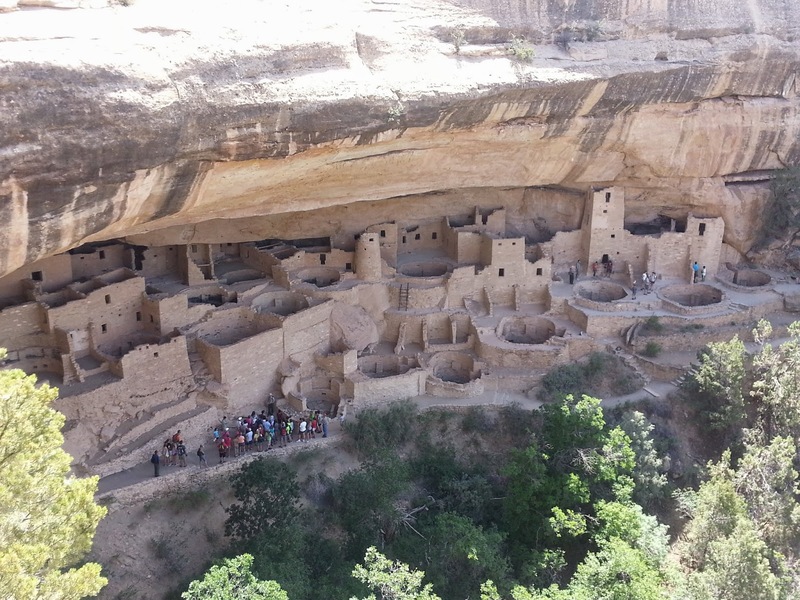 The largest of the cliff dwellings is called Cliff Palace which has about 150 rooms. It is believed that about 100 people resided in this dwelling. Some rooms are up to 4 stories high, some of them have fireplaces, while some have terraces. To me, the most interesting rooms in their dwellings are kivas which are something like prayer rooms used for rituals and ceremonies. They also have a very neat air circulation system and wind blocks to provide fuel to and protect the fire respectively. Given that there are many Kivas in a dwelling, it appears that religion and related ceremonies were a huge part of their lives. Balcony House is a medium size dwelling with 40 rooms. But its tunnels, passageways and ladders make it an interesting dwelling to visit. Trying to get out - And he did! Both Cliff Palace and Balcony House can be explored by ranger-led tours only for a small fee of $4 per person. The tours are totally worth it (one hour each) as the rangers explain the significance of different rooms and structures and transport you to the ancient times and into the lives of the Native Americans. This was my first time being in an archeological site and it was interesting to be there and to think about how the Native Americans lived during the 1200s. Standing there one can't stop wondering how our ancient people tried to blend with the Nature and lived such simple lives gathering food and living in alcoves while the generations that came later seem to have an insatiable need for material comforts and possessions and ended up destroying the Nature in the process. I also think that the ancient people had fear and respect for Mother Nature and as man became more scientific, he seems to have lost both and am not sure if it is a completely good thing. My thoughts and opinions aside, it is an interesting place to visit and I totally recommend the Morefield campground. Also the metate room restaurant in the Far View Lodge has great views and if you don't want to eat their expensive food, stop by at their lounge area upstairs for a drink or two. It has equally good views, a great terrace area and the guy playing guitar in the lounge isn't bad at all. And while you are near the Far View lodge, check out the Park Point, which is the highest point in the Park at an elevation of 8,500 feet. It has good views and the short walk is pretty too. Tip: Arrive early to get the best campsite and do look around in the RV sites even if you only have a tent. It is ok to set up a tent in an RV site, but don't tell the hosts that I told you so :) Just kidding!